강골 마을에서 가장 아름답고 들어가는 곳에 자리잡은 건물로 비교적 넓은 평야에 인접하여 있고, 해안과도 가까운 지역이어서 풍수지리상 터가 좋은 곳이다. 안채, 사랑채, 곳간채, 문간채가 규모있게 구성되어 있는 집이다. 대문을 들어서면 왼쪽으로 곳간채와 오른쪽으로 사랑채가 맞대고 있다. 안채로 들어가는 중문간채는 사랑채 서쪽에 있으며, 안마당 서쪽에는 곳간채가 있고, 동쪽에는 아래채가 배치되어 있다. 안마당과 사랑마당은 중문간을 통하지 않으면 출입하지 못하도록 나누어져 있다. 대문간채는 5칸으로 중앙의 1칸은 문간으로 솟을대문이 있고 왼쪽과 오른쪽에는 온돌방이 여러 개 있어 머슴이나 일꾼들이 사용하도록 하였다. 문의 오른쪽에 있는 곳간채는 오른쪽 끝에 안채에 통하는 문이 있으며, 2칸의 광과 1칸의 마루방으로 되어 있다. 광은 내부가 트여 있다. 사랑채는 남도식 구성으로 서쪽부터 부엌·사랑방·사랑윗방·대청의 순으로 놓여 있다. 부엌과 사랑윗방 뒷쪽에는 툇마루가 있고, 부엌의 윗쪽에는 다락이 설치되어 있다. 사랑방부터 대청까지 앞쪽에 툇마루가 있다. 안채는 동쪽 끝에 부엌이 있어 장독대가 있는 곳과는 거리가 멀지만 사랑채, 아래채와는 가깝게 있어서 편리한 점이 많다. 부엌 옆에 큰방 ·대청 ·작은방이 있으며, 큰방부터 작은방 앞까지는 툇마루가 깔려있다. 작은방은 옆쪽에 출입문을 달아서 하나의 딴 공간으로 꾸몄다. 안채의 동쪽에는 방과 대청으로 된 아래채가 있고, 사랑채 뒷면에는 작은 광이 별도로 있다. 집을 둘러싸고 있는 담장의 안쪽으로는 감나무가 많이 심어져 있으며, 사당은 따로 없다. This house is located at the most beautiful spot in Ganggol Village. Its location is ideal in terms of geomancy with a vast plain and the seashore nearby. 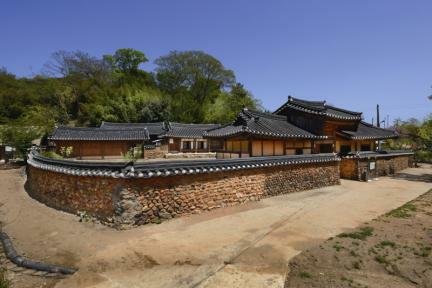 It consists of the anchae (women’s quarters), the sarangchae (men's quarters), a grain storage building, and the munganchae (gate quarters). Inside the gate, the grain storage stands on the left, with the sarangchae on the right. Another gate quarters leading to the anchae are attached to the west of the sarangchae. The grain storage quarters and outer quarters near the gate lie on the west and east of the inner courtyard, respectively. 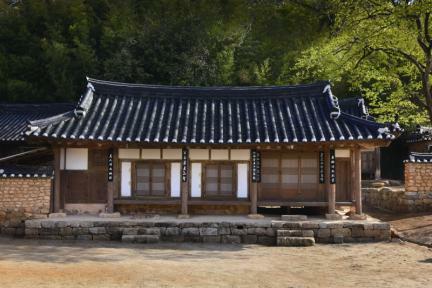 A middle gate is between the anchae and the sarangchae. The 5-kan (a unit of measurement referring to the distance between two columns) main gate quarters have a 1-kan high gate at the center and several rooms equipped with an underfloor heating system on both sides of the gate for servants or workers to stay. The grain storage quarters have a gate on the right end and consist of a 2-kan storeroom and a wood-floored room. 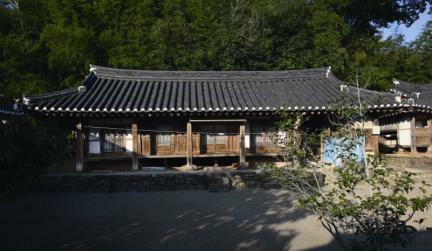 Built in the typical southern style, the sarangchae has a kitchen, two sarangbang (master’s room), and a daecheong (main wooden floor) arranged from the west side. 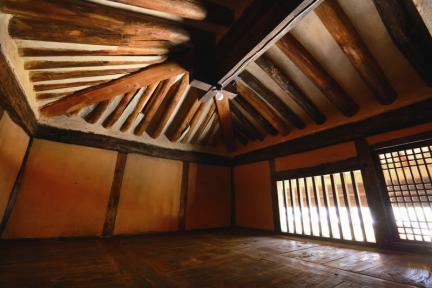 The kitchen and sarangbang have toenmaru (wood-floored veranda) at the back. The kitchen has an attic on the upper wall. The anchae has a kitchen at the east end, so it is a little far from Jangdokdae (platform for crockery for sauces and condiments) but is conveniently located near the sarangchae and the outer quarters. 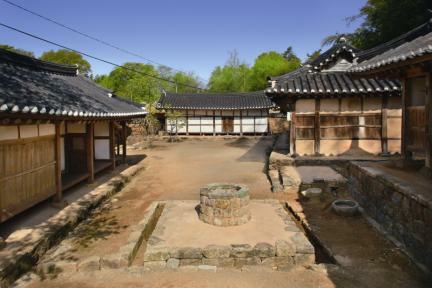 Beside the kitchen are the master’s room, daecheong, and a small room, all of which have toenmaru in front. The small room has a separate door. 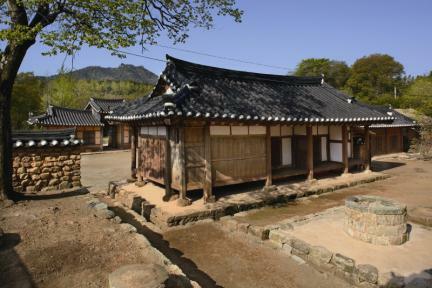 The outer quarters standing east of the anchae consist of a room and the daecheong. Behind the sarangchae is a small barn. The house is surrounded by many persimmon trees inside the fence, but it has no shrine. ※ Viewing of the cultural property above is usually available anytime but may be limited depending on the owner’s personal circumstances.